I've blogged numerous times in the past about packing for the Camino. Last week I read a blog post "Unpacking from the Journey" https://www.episcopalcafe.com/unpacking-from-the-journey/ and it made me think... So here's a reflection on the notion of unpacking. Most people who have ever backpacked or gone on camino spend lots of time wondering what to bring. I'd say most Camino pilgrims who have read up on the pilgrimage have spent HOURS thinking, shopping, weighing, evaluating. Not a single item goes in that backpack or daypack without careful attention to its weight and utility. One pair of walking shorts/pants combo. One pair of shorts in case you have to wash your shorts. A light charger for your phone that also acts as an extension cord so that you can share the limited outlets with others. With the backpack, it shouldn't exceed 10% of your body weight for a long journey. Every little bit counts. I am careful in how I pack. I place daily things at the top or sides and less frequently used items deeper inside. There's lots of attention to packing every day before I head out. I adjust the pack midway to make sure the weight is evenly distributed so I don't hurt myself. Most people overpack. They bring too much. My first camino was wildly overpacked. I wasn't even close to only 10% of my body weight. And my second camino, the 600 miler, I allowed myself to overpack but had just enough sense to remember lessons from the first one; I brought things I wouldn't mind leaving behind. Because that's what I did on that first camino. I left 1/2 of my stuff behind. Like the stone that sits in our pocket to be left behind at the Cruz de Fero, our fears and anxieties hold us down, causing pain in hidden ways - perhaps not at first, but eventually. We trudge on thinking we can't do with less because if there's an emergency we will be without. But as we do so, we creep ever so slowly towards our own internal emergencies. And that's when we realize you have to leave things behind. We dump things. It's somewhat comical, somewhat sad, and always with calm knowing when I watch someone at the albergues deciding what to dump from their backpack. They yearn for the quick fixes that will help them feel better. It's so much like life itself that I sometimes wonder if it needs saying. But we forget. And on our next trip, we need reminders. And on every subsequent trip, like the journeys around the sun we make every year, we learn a little more about what to take. For example, I've learned that socks matter more than anything else in the backpack. Seriously. Socks can make or break a long walking trip. I remember as a child that I was disappointed when I got socks for Christmas or birthday gifts. But now? I ask for them. And I am careful that I never leave behind something as special as socks. The real lesson in packing is not what you take, but what you leave behind. Leave behind those stones, those comfortable trinkets of our hearts that we think we need but just get in our way. Bring only that which makes every single footstep lighter, every single moment brighter, every single experience remarkable. All else leave behind. And if you take them, leave them on the side of the road, like the grave markers you see all along the camino, marking and remembering that which you choose to leave behind. Laundry detergent? Good bye. Extra clothes? Adios. Heart ache? Adieu. Tears? Let them evaporate into air we share between us. We talk about what we bring and not what we leave behind. We also forget to talk about what we do at the end of the journey. We unpack. Some people turn that bag upside down and dump it out on floor. Most people take things out carefully, putting things down briefly, and hurry to get the clothing into a proper washing machine. If we bought some souvenirs, we set them aside to enjoy. We share the gifts as soon as we can. Other things take longer. Sometimes I wonder where my water pack or poncho is and I realize it's still in the camino backpack. We simply don't spend anywhere near as much time unpacking as we did packing. In fact, this ritual of unpacking happens as often as we pack. For every time we pack that backpack - every single morning - we unpack parts of it - every evening. You have to reach in and see what's in there and decide if you need it right then or there or it can be set aside for now. It took me a while to realize it, but that ritual of unpacking is meditative and spiritual. You simply have to pause. If you unpack hastily, it makes re-packing that much more difficult. If you unpack without thinking, you might misplace or forget where you put something. If you unpack without reflection, you could just be unpacking something that you didn't need. And such is life. We forget to pay attention to unpacking the events that make up life itself. We do it hastily, or thoughtlessly, or without reflection and we wonder why we spend so much time thinking and packing again the next day. But if we pause, reflect, and think, what wonders we discover. I get delighted, just thrilled every day on camino, when I take out a pair of dry clean socks. I wash the laundry including the socks, and as I dry, I joyfully take out and put on the soothing clean ones. They might not bring you as much as joy as to me, but for my feet, they're better than even a foot bathe. Wouldn't it be great if we could do that with our lives? Do you know which things in your life, something as trivial as socks, make you happy? Comfort you? Soothe you? Heal you? Do you ritualize that joy? Do you take your joy for granted? I hope you don't take your socks for granted. 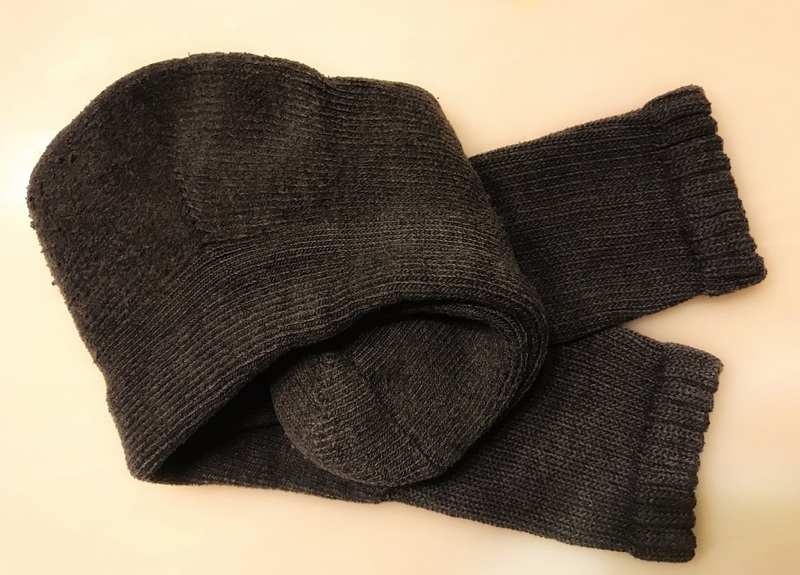 Don't wear, wash, hang out to dry your socks without recognizing how they felt on your long walk. I put on my socks with joy every day. I wash them at the end of the day's journey, ridding them of the soil but knowing that the toil and dirt wears at them just a little bit every day. But I have them for now. I let them dry and then pack them. And the cycle repeats. So I must ask... what are the socks in your backpack, the things that could bring you joy daily? What are the socks that you pack lovingly and unpack with anticipation? Or do you forget about the joy that socks bring you, putting them on without remembering what they mean to you? May you unpack your socks that are there waiting for you in your backpack, there because they were packed just for you, and may you wear those socks with comfort and joy.